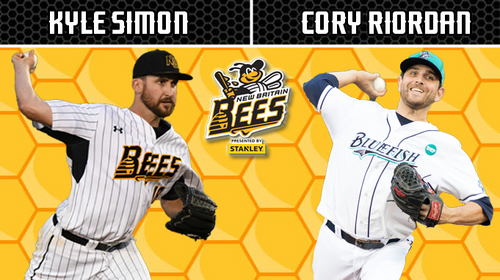 (New Britain, Conn., Feb. 12, 2019) – The New Britain Bees today announced that pitchers Kyle Simon and Cory Riordan are the first player signings of the 2019 season. Kyle Simon returns to the Bees for his ninth season of professional baseball, fifth in the Atlantic League, and fourth in the Hardware City. Last year, the righthander made 24 appearances (23 starts) for New Britain, recording eight wins with a 4.31 ERA, 93 strikeouts, two complete games, and one shutout over the course of 144.0 innings pitched. The 28-year-old was originally drafted by the Baltimore Orioles in the fourth round of the 2011 MLB amateur draft. He spent one season in the Orioles farm system, before being traded to the Philadelphia Phillies with Gabriel Lino in exchange for future Hall-of-Famer Jim Thome in 2012. Simon played three years with the Phillies organization, reaching as high as the Triple-A level in 2014. He would then make his Atlantic League debut in 2015 with the Lancaster Barnstormers, followed by his Hardware City debut the following year. The California-native holds the Bees all-time records in wins (28), games pitched (110), games started (66), complete games (9), shutouts (3), innings pitched (435.1), and strikeouts (251). In 239 career minor league outings (81 starts), Kyle owns a 46-46 record with a 3.65 ERA, 445 strikeouts and 1.29 WHIP in 728.0 innings pitched. Cory Riordan makes his way to New Britain for his fourth season in the Atlantic League and 13th of professional baseball. The Connecticut native pitched for the Somerset Patriots last year, making 14 starts and earning three victories with a 3.13 ERA and 62 strikeouts across 83.1 innings pitched. The 32-year-old made his Atlantic League debut with the Bridgeport Bluefish in 2015, and then returned to the club again in 2017 following a stint with the Detroit Tigers organization. In 32 combined appearances (31 starts) with the Bluefish, he posted a 12-9 record with a 3.47 ERA and 170 strikeouts over the course of 210.0 innings of work. Cory was also named to the Atlantic League All-Star team in 2017 prior to having his contract purchased by Fubon of the Chinese Professional Baseball League. The righthander was originally drafted in the sixth round of the 2007 MLB Draft by the Colorado Rockies and spent seven years within the organization, reaching as high as the Triple-A level. He also spent the 2014 campaign overseas in the KBO with the LG Twins. In 289 career minor league appearances (230 starts), Riordan owns 73 victories with a 4.21 ERA and 1,151 strikeouts across 1,512.2 innings.